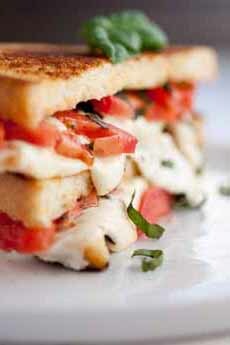  Today’s recipe: a Grilled Cheese Caprese sandwich from Marge Perry & David Bonom (photo courtesy Pots and Pans). 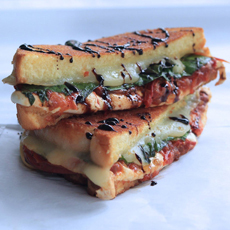 Grilled Cheese Caprese without the balsamic drizzle. Here’s the recipe from Cooking Classy. Don’t want to grill it? Here’s the recipe for an “uncooked” Caprese sandwich from Somewhat Simple. 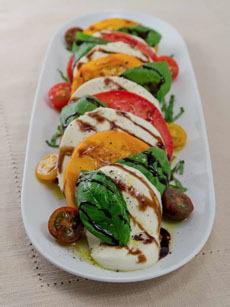 A traditional Caprese salad (photo courtesy Balducci’s). A couple of years ago we received this recipe for a Caprese Grilled Cheese Sandwich from Pots and Pans kitchenware outlet. We made it, we liked it. But we never published it. Since April is National Grilled Cheese Month, and April 12th is National Grilled Cheese Sandwich Day, it’s time. Caprese salad is so popular in the U.S.—as are grilled cheese sandwiches—that the idea was just waiting for food writers Marge Perry & David Bonom to put them together. 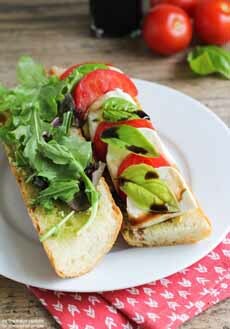 They used the balsamic vinegar of a Caprese salad to create a drizzle for the sandwich. You can purchase balsamic glaze if you don’t want to spend 10 minutes making it from scratch. If you make it, don’t use the pricey balsamic; any supermarket balsamic will do here. Marge and David used Martin’s Potato Bread, but we had a baguette on hand and used that. You can use whatever bread you like. They also added slices of provolone cheese to the sandwich, to add flavor complexity. If you don’t want it, leave it out. Or, substitute another cheese of choice. It won’t be a classic Caprese, but have fun with it. 1. PREHEAT the oven to 350°F. Line a large baking sheet with parchment paper. 3. COMBINE the vinegar and sugar in a 1.5-quart saucepan. Bring the mixture to a simmer over medium heat, stirring occasionally. Simmer until the liquid is reduced to a syrupy consistency, about 10-12 minutes. 4. PLACE 4 slices of the bread on a work surface. Top each with 2 ounces of the mozzarella. Place 2 tomato slices on top, then 4 basil leaves, followed by 2 slices of provolone cheese. Place the remaining slice of bread on each sandwich. 5. SPREAD the outside of each sandwich with 2 teaspoons of the butter. Heat a large 12.5-inch nonstick skillet over medium heat. Add 2 sandwiches, and cover the pan with a lid or large piece of aluminum foil. Cook until the sandwiches are golden brown and the cheese has melted, about 3-4 minutes per side. Repeat with the remaining sandwiches. 6. TO SERVE: cut each sandwich in half diagonally and drizzle with balsamic syrup. WANT TO CREATE YOUR OWN SIGNATURE GRILLED CHEESE SANDWICH? Here’s a guide to create your own unique grilled cheese sandwich. Also check out these grilled cheese tips.